A very in famous Carbon Twitter Client, currently the application which available for Web OS now seems to be very soon available for Android and Windows phone users. After the recent update for twitter and buyout of Tweetdeck by twitter, there seems to be no innovation of what so ever in terms of twitter clients. The late WebOS will not go down in history as one of the most successful mobile operating systems that have been, but has some very interesting strengths and solutions, as like the exclusive Twitter client called Carbon. 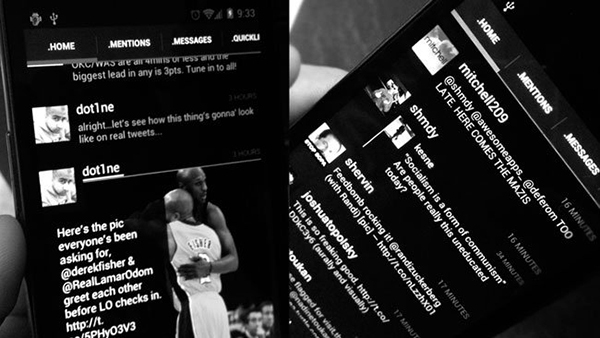 The Carbon Twitter Client is distinguished from its competitors by its elegant and attractive interface, entirely in black and white. Fortunately, the application will not die with WebOS, because those responsible for the same have announced the development of new versions of Carbon Twitter Client for Android and Windows Phone. To show that they are serious, have posted some pictures demonstration of the interface that you can see the head of this article. At the moment there is no confirmed date for this doubly return of Carbon , but at least in the case of Android version we have an official profile on Twitter to follow the developments of the project. It promises to be an excellent alternative to be considered by the users of these two systems. Samsung Galaxy Note 8: Release, Rumors, Deja Vu?